Inspired by Mexican artist Pedro Reyes and an ancient lineage of Swords to Plowshares creators, we choose to locate our alchemy and cultural healing work in the US (occupied Turtle Island). Intention in medicine is defined as the healing process of a wound. 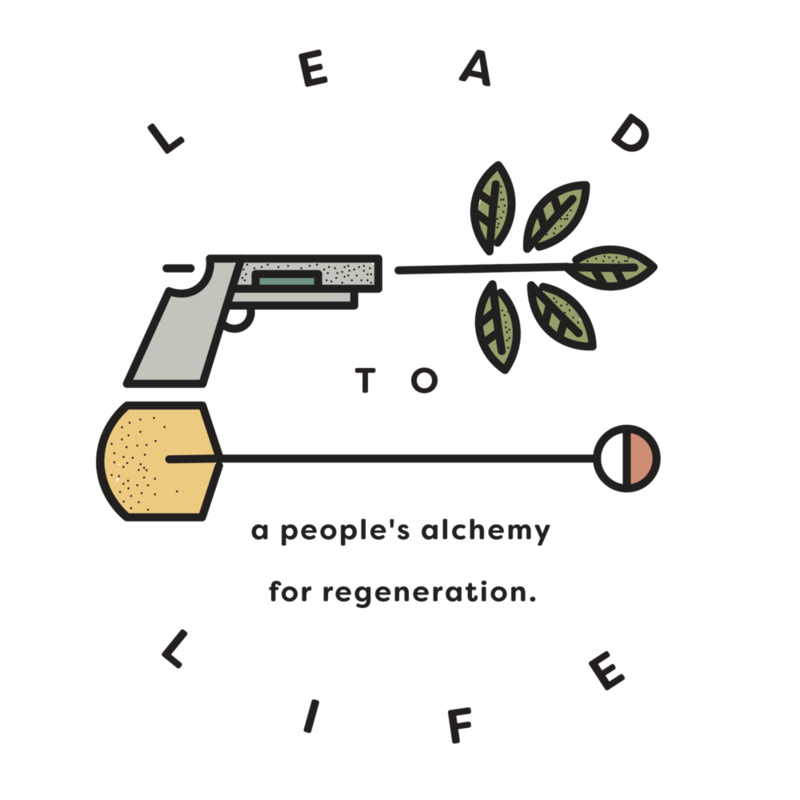 Our intention through Lead to Life is to transform that which ends life into that which sustains life - to facilitate an alchemical healing process that can physically transform both our weapons and our imaginations. rekindle relationships of reverence and reciprocity with each other and the Earth. The original collaborators, brontë velez + Kyle Lemle met in July 2016 as inaugural recipients of the Spiritual Ecology Fellowship. Through that connection they were able to bridges their complementary and diverse histories in community organizing, art as social practice, ecological restoration and climate resilience to birth Lead to Life. During the fellowship, they have built strong relationships with leaders around the world who are bridging the gaps between faith, activism, ceremony and resistance. We will be sharing more on our community partners soon! brontë is guided by “the many rivers that have come together” to make and sustain them. as a black-latinx multimedia artist, life-long student, and designer, their praxis (theory + action) lives at the intersections of critical geography, black liberation ecologies and creative placemaking. they are committed to joy as medicine, decomposition as rebellion, and live by the call that "black wellness is the antithesis of state violence" (Mark Anthony Johnson). their work intends to compost the violences forged by environmental racism through radical imagination. this commitment iterates through several mediums and this year grows through Lead to Life. in 2016, brontë worked as a copy editor on a retrospective of Mexican artist Pedro Reyes’ work. when they witnessed his projects Disarm and Palas por Pistolas - in which he transforms weapons into shovels and instruments - they were met with profound healing and a deep desire to share this medicine through continuing the rituals in the united states as a direct response to losing a dear friend to gun violence alongside the larger traumatic impact on black communities and environments from police brutality. they are currently blessed with the privilege to learn from and support youth of color in Oakland as a food justice educator with Planting Justice. Finding grounding in the interdisciplinary, jazmin (they/them) is a queer non-binary multiracial Afro Indigenous Boricua from Kissimmee, Florida. They root into this work via a community study in Black Indigenous regenerative agriculture, ecology, plant medicine, and critical connections held in reciprocity. Their draw to the decomposition of violence distributed through environmental racism and state violence, is not a work of leisure, but a deep committed to their lineage, the diaspora, and communities that raised them. They are currently studying Sustainable Environmental Design and Conservation Resource Studies at UC Berkeley and deepening their relationship to the creation of speculative media. Kyle is a community forester, musician & organizer working at the intersections of environmental justice and cultural regeneration. He was worked for a number of international environmental NGOs and grassroots tree planting projects from the forests of the Himalayas and Southeast Asia to the streets of San Francisco. As an official delegate to with SustainUS and the US People’s Delegation, Kyle organized a large action against the Trump Administration at the 2017 United Nations Climate Talks that made international headlines. He is a Spiritual Ecology Fellow, a Princeton in Asia Fellow & a graduate of Brown University. When he is not planting trees, Kyle serves as founder and co-director of the Thrive Choir & Thrive Street Choir, which performs original gospel-inspired music for social justice at festivals, conferences and direct actions across California, and every month in their home beloved community of Thrive East Bay in Oakland. Liz Kennedy is a storyteller, activist, and researcher from Ann Arbor, MI (originally called Gaa-giishka'aanig by the Objibwe people). She is committed to decomposing environmental and state violence and their roots in white supremacy, capitalism, settler colonialism, and heteropatriarchy. As a student at Duke University, Liz began her organizing career by protesting the Dan River coal ash spill in 2014. She later joined the Moral Monday Movement under Reverend William Barber’s leadership, and became a campus representative for the NAACP working at the intersections of racial, environmental, & social justice. She continued her commitment to environmental justice by working for United Way in Flint, Michigan in 2016, supporting community-led solutions to the water crisis. Liz recently completed a fellowship as a Research and Policy Analyst with the NAACP Environmental and Climate Justice Program. She co-authored texts on just transition and energy justice, equitable climate change adaptation, youth organizing, black representation in the green economy, food justice, and more. As an intersectional black feminist, she's passionate about uniting and queering transnational struggles for environmental, gender, racial, and economic justice.